While the internet tries to make Job Application easier, there’s an age old problem of the Employment Process that makes Job Application more difficult. What type of interface and handling are you dealing with? You may have made a few job applications, and you may be accepting of the fact that different companies and organisations will have different cultures, and hence different ways and forms of Job Application. But one element behind all that intreface and handling, is the key question of who all that Job Application information is going to? Answer that, and you can greatly improve your job application success. Clearly, there are differences between companies, in both size, scale, location and approcah to recruitment. Whilst all should be legal, these differences will necessarily dictate changes in how job applications are processed and handled. But as I have said many times before, one principle always in job application and employment: People employ People. This is why I always put the emphasis on getting to and enagaing the Hiring Manager as early as possible in the Job Application Process. Who is handling the job application interface? Presently, around 50% of hiring is undertaken by large corporates (companies with a turover of more than £100M), and the rest by other organisations. The top1000 companies in the UK do as much hiring as the rest of the organisations, combined. 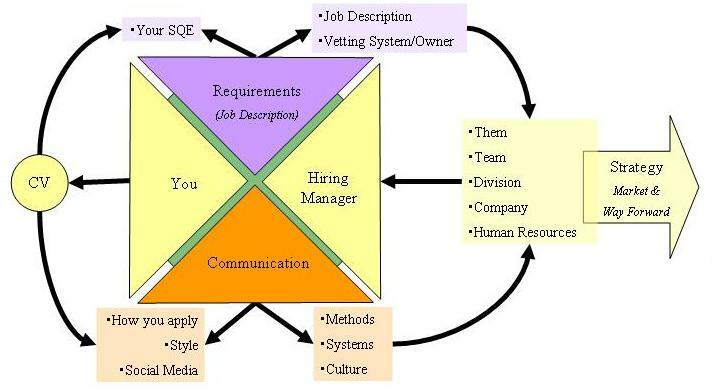 This genreally means that the Job Application interface is handled for these types of companies by Human Resources. In the old days, HR hired and Hiring Managers got what came out of the hiring process. 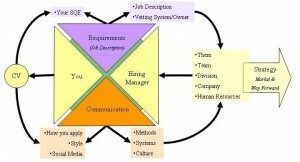 These days HR facilitate the process, which is driven by the Hiring Manager. If you have choice, then personally avoid HR! They have a different agenda to the Hiring Manager, and will be some what distant from most as hiring will be a fairly irregular process for that Hiring Manager. If you have to go through HR, then ask questions which only the Hiring Manager could answer. Ask enough, and most HR people just hand you over to the Hiring Manager, as they don’t want to play postbox. If you see multiple job opportunities at the same company, then use HR to guide and direct you in: agreeing the best job that should apply for aginst your competencies; guiding you to which job has the least competition. Some recruiters will find what they know are market-short skills, and then pitch these to target employers. In other words, they may not even have a brief or a signed contract with that employer, they just know that that employer will be interested in those skills. Until you can answer the above questions, and know both why that Head Hunter?recruiter know’s what the ideal candidiate looks like/the hiring process time scale, then remember that your CV is currency in this market place. Don’t hand it over until you can answer all four questions, other wise unfortunately you just become recruitment fodder. My guide, if you are early in your career, is to be cautious of SME’s. Companies of less than 24 employees won’t have formal systems, and hence any training will come secondary to earning revenue. This is particualrly true in the Professions, such as Accountancy Jobs. In all cases, where the Hiring Manager is handling hiring, expect the timescales to vary (as their workload and hence focus does), and that the key issue will be social fit, ie: do you get on with them? So find business ad professional things in common, and talk about industry issues over personal specifics or their business strategy. You need to build to enable yourself to be seen as the solution to their employment opportunity. If you find a combination of all two or more of the above, be very cautious! More than one recruiter approacing you means that its a contingency fee based opportunity, and it becomes like picking a horse in the Derby or the Grand National in which to win a race. So don’t pick a horse, choose to speak to the prize giver. At least one recruiter in this situation will be desperate enough to giveaway enough information to allow you to directly contact the employer. Other combinations means that although the organisation has one agreed formal hiring process, the other person who has approached you doewn’t agree with that process, or their has been a relationship failure. Be very, very cautious in this situation. At some point, someoe will win in the orgaisation and someone else will lose, and betting either way is not wise. If that’s the organisation that you really want to work for, and you accept that this job application is a bet, then get as close to the Hiring Manager as possible. As I have written before, Job Application Success is all about people, and specifically the Hiring Manager. But recognising who is handling the interface will greatly improve your chnaces of employment success. Thomas, a job seeker, asks: In a job search at present, and getting confused. Some companies have a manager do the hiring; some have HR; some have recruiters; and some have all three. Why is this? Should you tailor your job application, CV and job interview for each type of hiring person? Accepting that different companies will use different processes, all of which have to be legally compliant, you also have scale/size differences to cope with. All of this makes job applicatio far more complex that ideal for the job seeker, placing additioal challenges in their pathway to employment. The simple answer is that People employ People, specifically the Hiring Manager. Anyone else that you speak to is simply facilitating the hiring process, and hence although they may well influence the choice of the eventual successfully job applicant, they won’t be the person who makes the final decision. Only the hiring manager does that. What is their relationship to the Hiring Manager? What do you need to do to enable them to place you in front of the Hiring Manager? If you can’t answer those two questions, then they are a barrier over a facilitator. Also, as another human being, they will have a different view on who the ideal job applicant is to the hiring manager. So it is essential that you get to the hiring manager as quickly as possible. The basic answer to your question is to use the same Professional CV no matter what the interface, but you have to choose when to use it with each different type of interface, to ensure that yoy get and provide the right information to eable you to get to the next stage. The most critical of these is the recruiter, who I suggest most use their LinkedIn Profile for, as opposed to their CV. At the end of the day, People employ People, and ayone else is simply facilitating the hiring process. Accept this, and you will make quicker progress to getting employed. Speculative job application: eMail or letter? Thanks, what a great post! I came to this one via Yahoo, am very glad that I found it and your site. Studying this info and many of the other posts, very glad that I discovered just the answers I needed. Thank You!